Labor would comfortably win election "held now"
Firstly, my congratulations to Antony Green, AO! In our last exciting episode, the Coalition government had launched a Budget widely seen as a blatant attempt to get a polling bounce, and received no immediate return. So the theory that the Budget would restore the government's standing retreated to the idea that it would take a little while. Another five weeks down the track the Budget hasn't changed a thing, and nor, in fact, has anything else. Throughout the year so far there have been little moves back and forth but they may as well be random, especially when they are informed by such a small amount of polling. The current run of polling feels a lot like the second half of 1995, when the Keating government always seemed vaguely competitive and kept trying things but the dial wouldn't move off 47-48%. With internal tension never far away, the current government would struggle for clear air even if the voters were listening to what it had to say, and if they were listening they would hear quite a bit of confusion anyway. How is this bleak situation recoverable, if at all? For now it is not obvious. Yes polls can change a lot, and sometimes quickly, as we saw in the UK, but it's hard to see what might generate a change in this government's favour. A story behind the current headlines is a mini-resurgence in the One Nation vote. Just when it seemed the party had maxed out following the WA election shambles, it has now moved in a few weeks from 5% to 9% in Essential and from 9% up to 11% in Newspoll. The issues mix, including terrorist attacks and centrist climate noises, has been ideal for Pauline Hanson's party, which I suspect is continuing to be used as a vote-parking lot by disillusioned malcontents (pun intended) on the right. We're two weeks away from the first anniversary of the Turnbull government's re-election. A few polls very early in the term were published with 50-50 2PPs, but that was mostly because of the use of 2013 rather than 2016 election preferences. The government will, barring something very startling in the next two weeks, have trailed in aggregated polling for its entire first year after re-election. I examined the fate of governments that have trailed for a year at some stage of their term when we reached that milestone under Abbott. Six of the ten such governments (including Abbott's) have been re-elected, two of them ditching their PM at the time to do so. However it is highly unusual for a government to trail for a whole year immediately after being re-elected. In the past even the most helpless governments have tended to bob above the 50-50 line for the first few months of their term before sinking. Possibly the Menzies governments of 1951-4 and 1961-3 (both of which were in the end returned) trailed straight out of the blocks, but there was not enough polling to say. The most recent Newspoll delivered more bad news for Prime Minister Turnbull. He finally poked his head above a net rating of -20 last time, only to sink back to -23 (32-55) this week. Curiously, Bill Shorten polled exactly the same result. This is the third time in Newspoll history this has happened, with both previous cases involving Julia Gillard and Tony Abbott in 2011. Turnbull continues to enjoy a much larger "better Prime Minister" lead over Bill Shorten (44-31) than the 2PP polling or his poor personal ratings would predict. This seems to be partly because he polls unusually well (or perhaps just as pertinently, Bill Shorten polls rather badly) on the matchup among Greens voters. Essential this week had Shorten ahead just 35-31 among them. Essential had Turnbull's net rating up to -9 (36-45), his best since November, with Shorten on the same (34-43), which is his best since January. Essential gave Turnbull a lead of 39-26 as better PM over Shorten. Essential asked how the Budget had sunk in for voters and the Others voters on their panel (who are mostly One Nation) were notably even more hostile about it than Labor or Greens voters. There has been some new polling about energy policy, one novel point of which was that it wasn't commissioned by the Australia Institute. In general renewable/clean energy polling struggles to get past the pony-poll stage in which voters instinctively react positively in a way that then fails to predict their political behaviour. Essential found that voters said they would on average put up with a 5% price rise to reduce carbon emissions and invest in "new energy supply", but that few would accept 10%. Newspoll found that voters lean slightly towards an increase on the government's current renewable energy target, except for One Nation voters who lean slightly towards decreasing or scrapping it. Another Newspoll question showed strong (48-22) opposition to following the United States out of the Paris Agreement, but I am sure the response would have been more equivocal had Donald Trump not been named in the preamble. A couple of new commissioned seat polls with voting intention results. The Australia Institute's ReachTEL of Kooyong had the Liberals on 48.9% (-9.3 compared to election), Labor 25.5 (+5.7), Green 17.0 (-1.9), One Nation 3.9 (didn't stand) and Others 4.8, after redistributing the undecided. 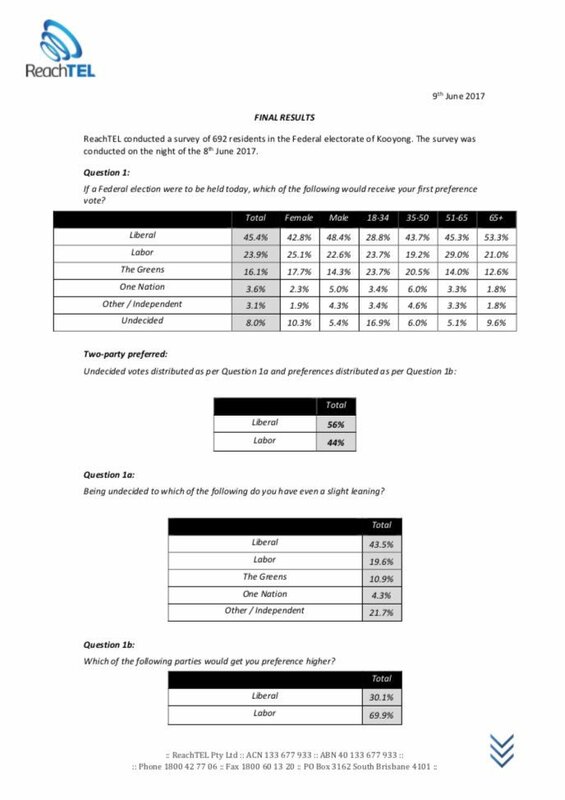 The 2PP based on respondent preferences was 56-44 to Josh Frydenberg (6.6% swing to ALP) and I get 56.2 by national last-election preferences. Finally, a poll, which I presume to be a robopoll, for the long-established but low-profile WAOP outfit, had Christian Porter losing the seat of Pearce with a 52.2% 2PP result against him, a 5.8% swing. It's not even stated how the 2PP is calculated and the merging of "other" with "unsure" doesn't help, but I'm suspecting it's a respondent-preferences result, because last-election preferences would be about two points worse. There is really no past form on which to gauge how accurate WAOP is and more details of this poll should have been released. The poll was commissioned by Campaign Capital, a Labor-connected PR and government relations firm. Hello Dr Kevin, I noticed you being referenced in the article matter in the above by Antony Green in a Melbourne Age article, or it may have been the ABC, that kind of tells me how your skill as a Psephologist are rather keenly appreciated. The predictability of Federal or even State elections as they might alter in their trending and whatever other influencing factors that would come under your notice. Tis all quite fascinating how one mind can encompass such a vast magnitude of contributing influences. I think you could be referring to this: http://www.abc.net.au/news/factcheck/2017-06-19/fact-check-did-the-coalition-lose-a-million-votes-last-election/8538370 If so, thanks, I did most of the interviews for it some time ago and hadn't noticed it was up! I'm busy with contract work today during the day. I think Antony might be in a plane somewhere but probably by tonight someone else will have the answers! Wow! That's quick on their part! Kervin, you would be pleased to hear that everytime I link one of your updates plus a little bit of comment I get consistent high pageviews. When will you post your next Poll Roundup and will you now be including that strange YouGov result into the equation? Probably Tuesday or Wednesday next week. YouGov will start being included once their third poll comes out (two so far) but I will only be using their primaries and ignoring their respondent preferences. Cheers for the reply mate, look forward to it.